Tunisia underestimated the negative impact a small group of hardline Islamists would have on its ability to attract investors and reform its economy, said President Moncef Marzouki. Marzouki, attending the United Nations General Assembly meeting for the first time since the Arab Spring protest movement swept him into power, told Reuters he is also calling for an Arab peacekeeping force to move into Syria to end its civil war. Speaking two weeks after protesters were killed and the US Embassy was ransacked in the capital Tunis, Marzouki spoke to a group of executives and bankers in New York about his country's political and economic reforms in hopes of attracting needed investment. The protests were sparked by Islamists who blamed the United States for a film that mocks the Prophet Mohammad. "Our police estimate there are just 3,000 of these Salafists in the country of 10 million," Marzouki said after speaking at an exclusive dinner organized by the Business Council for International Understanding. "There was a lack of security measures. We didn't expect those people to be so violent. Now it is a signal that we have to stop the phenomena because otherwise they are harming the image of the country," he said. Tunisian authorities are hunting for Salafist Saif-Allah Benahssine, the leader of the Tunisian branch of the hardline Islamist Ansar al-Sharia group that is believed to be behind the Sept. 14 attack on the U.S. embassy. "Before we thought it was a minority and they have very few people and they are not dangerous. 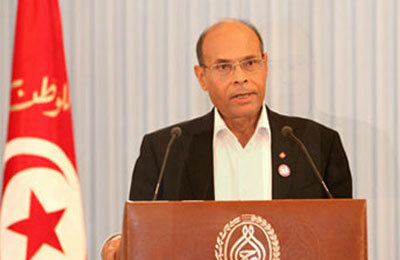 But now we realize that they are very, very dangerous," Marzouki said. Tunisia's violence erupted just three days after protesters in Libya's eastern city of Benghazi attacked the US consulate, killing the US ambassador and three other Americans. Marzouki condemned the attacks on the US diplomatic posts, calling them a threat to his relationship with Washington, a key political and economic ally. Tunisia's economy, heavily based on tourism, has recovered slowly, remaining below the 3.5 per cent gross domestic product growth target for the year. Marzouki, a secularist, was elected president under a power-sharing deal with the moderate Islamist Ennahda party, the winner of Tunisia's first democratic election held a year ago. He was a political prisoner under president Zine al-Abidine Ben Ali, who ruled for 23 years. Tunisia was the birthplace of the Arab Spring protest movement nearly two years ago that led to the ouster of Ben Ali, and also to changes in governments of Egypt, Libya and Yemen. Marzouki spoke bluntly about Syrian President Bashar al-Assad, whose armed forces have failed to quell an 18-month-old uprising that has killed 30,000 people, according to activists. "It is nightmare and it has to be stopped. The only way I see is to put the pressure on friends of the regime to say the game is over and now he must quit," he said. Foreign ministers and senior diplomats from the "Friends of Syria" - a group that includes the United States, France, Saudi Arabia and Turkey - are due to meet in New York on the sidelines of the UN General Assembly on Friday. World powers remain divided on how to handle Syria's escalating violence. Russia has vetoed three times U.N. Security Council resolutions on Syria and said it would never support a U.N. resolution that could lead to military intervention. Marzouki said an Arab-led peacekeeping force should enter Syria, saying the country is completely destroyed and a cause for concern if and when Assad is no longer in power. "This is really important. It would probably be chaos and the army is not accepted after what they did," he said.